Modern meets cozy There?s something fantastically Finnish about this family house on the Jollas peninsula, located southeast of Helsinki. Could it be the homey modernism balancing clean geometric lines with warm timber cladding" The windows perfectly positioned to ensure privacy from the neighbors while taking full advantage of winter sunlight and ocean views"
Designed by Helsinki-based Oratraum Architects, the home was built for an active family of five. 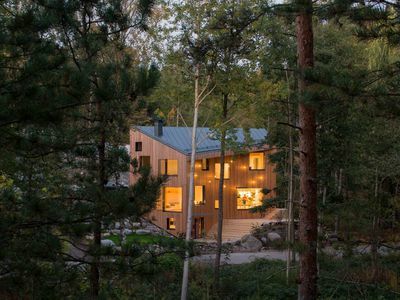 Its defining exterior element is a steeply angled shed roof and its vertical cladding of Siberian larch slats, which will age and acquire patina over time. The roof, chimney, and window frames are all a sleek black. The first floor holds shared spaces like the airy living room, dining room, and kitchen, where walls are all-white without any moldings. Both the ceiling and floors are made of naturally hued cross-laminated timber. Upstairs features a suspended-netting lounge, master bedroom, and three children?s rooms?which are outfitted with a trapeze and climbing wall.